Sciatic and cervical nerve root entrapment can be an extremely painful and debilitating condition. Although the long term outcome in most cases is invariably good without the need for surgery, in the short term delivery of anti-inflammatory medicine direct to the source of irritation around the spinal nerve is beneficial and provides excellent pain relief. If the standard route approach, ie, epidural steroid injection does not provide adequate relief or is inappropriate then an injection around the identified nerve root is performed under X-ray control. 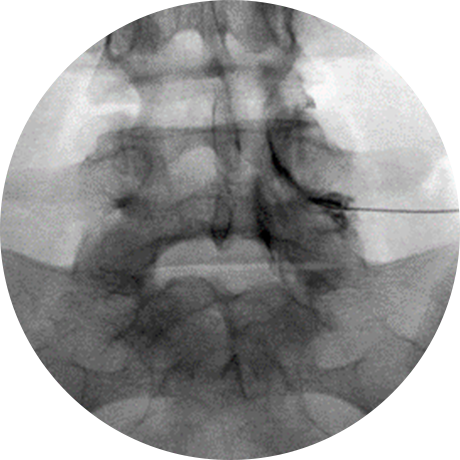 This involves guiding a fine needle under X-ray control to the affected nerve where it exits from the spinal column. A small amount of radio-contrast material is then injected to display the nerve root and to assess its flow pattern before injecting a small volume of corticosteroid with local anaesthetic. This procedure is performed as a day case without the need for general anaesthesia and can lead to fairly rapid recovery. There may be some temporary numbing or heaviness of the limb for an hour or so. Patients are usually fit to leave the clinic within an hour but need to be driven home. Complications are rare but the use of particulate steroids have been implicated as a cause of spinal cord ischaemia leading to paralysis or death in a few cases. Hence we prefer to use non particulate steroids in all cases to avoid the risk of blocking any small arteries to the spinal cord.